← A Secret About Melissa Wrolstad I Didn’t Know! In 2009, after I had interviewed several singer/songwriters on Alive with Clive, it occurred to me that many of the songs I heard on the show were inspirational in nature. So, on March 22, 2009, in a Blog post entitled “Your Life Depends on This!” which you can see when you click here, I announced that I was launching a contest to determine The Most Inspiring Song Sung on Alive with Clive So Far! 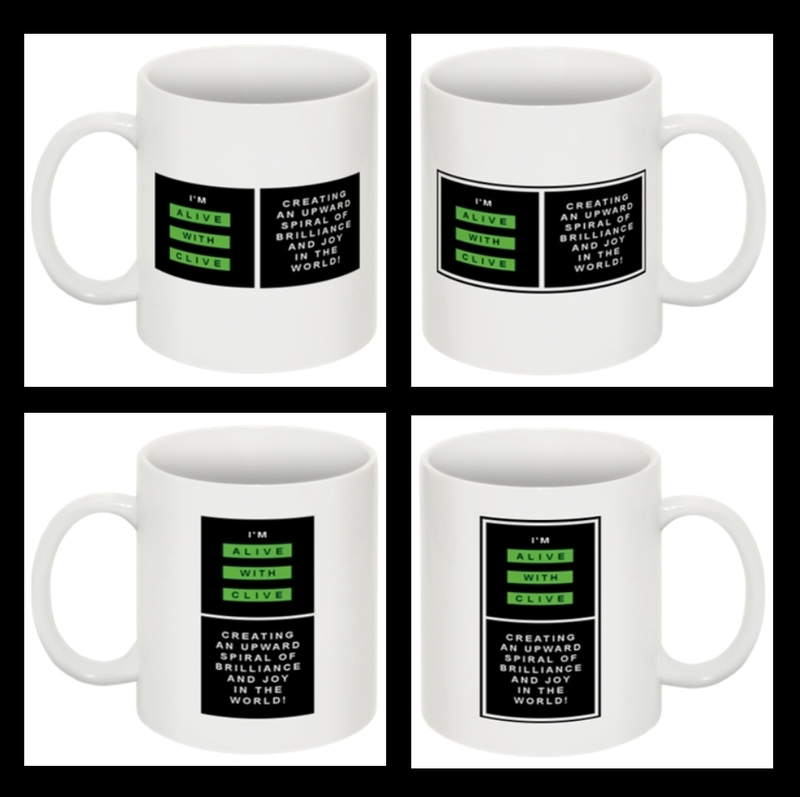 The imminent launch of The Alive with Clive Gift Store. So the contest to find The Most Inspiring Song Sung on Alive with Clive So Far! was thus put on hold. In the past two years, though, I have continued to hear many more inspiring songs sung by singer/songwriters I’ve interviewed on Alive with Clive. And ideas to cause worldwide attention to be focused on the contest have continued to percolate inside my head. So now I’ve decided to resuscitate the contest to determine The Most Inspiring Song Sung on Alive with Clive So Far! and make it far more breathtaking than I originally imagined it could be! I will continue to write Blog posts about additional songs I regard as inspirational in nature, and these songs will be eligible to win the contest. The point will be reached at which all the songs to be entered in the contest will be determined. First, voting will take place to determine which songs are most popular and which songs least popular. Second, for three-day periods, the public will be asked to vote on one song against another and the winning song will then advance to the next round, like tennis players at Wimbledon move to the next round after winning a match. Ultimately, the contest will be determined by voting between the two songs that reach the final! A sponsor will be sought to provide $100,000 in prize money. $5,000 to the singer/songwriter who created the song that did not reach the final but received the higher number of votes in the semi-finals. In the event of a tie, the $5,000 will be shared equally by the singer/songwriters who created the songs that reached the semi-finals but did not advance to the final. $5,000 to the charity that receives the third highest number of votes. Members of the public will have the opportunity to nominate charities with IRC Section 501(c)(3) status for voting. All who vote for songs or charities will be required to provide their name and email address before being eligible to vote and win prizes in drawings. Potential sponsors will bid for the right to be the sole and exclusive sponsor of the contest to contribute the $100,000 in prize money. The bidding will start at $25,000, and there is likely to be more than one round of bidding. The amount paid by the highest bidder will be used by Synergistic Promotions Corporation, the company managing the contest, to fund the creation and administration of the contest, and a portion of the amount paid by the highest bidder will be contributed to people affected by HIV/AIDS in South Africa. The contest will present the highest bidder with a multitude of far-reaching opportunities to gain national and international exposure, enhance goodwill, increase brand awareness and boost revenues. The benefits of being the highest bidder will be set out in a sponsor proposal, which will be available soon. In addition, the sponsor will be encouraged to make prizes available to be awarded in a drawing to voters who vote for songs in each match and to voters who vote for charities. In the meantime, representatives of corporations interested in participating in the bidding should send an email to clive at alivewithclive.tv with the words “AWC-MISC Interested Bidder” on the subject line. The contest has the potential to become one of the most intriguing and fascinating ever to be presented for the attention of music lovers all over the world, and is likely to be discussed on a multitude of different radio and television shows, as well as in magazines and newspapers, on an ongoing basis. An added benefit for those who choose to participate and vote is that they will gain inspiration for their daily lives by listening to and reading the Blog posts about the songs. Ultimately, the Blog posts about the songs will be compiled into a book about the contest to be sold in conjunction with a compilation CD or CDs with all the songs that were entered in the contest, and it will also be possible to download the songs. Furthermore, the sole and exclusive sponsor will be featured in the book and the inserts to the CD, and on the Web pages relating to the contest. Singer/songwriters who have been guests on Alive with Clive and who have songs in the contest will receive additional exposure from this contest. Furthermore, even those who don’t have songs in the contest will be more likely to be noticed, and be seen in video clips posted on The Alive with Clive TV Channel on YouTube (which you can see when you click here), as a result of the contest too, because of the growing awareness about Alive with Clive. In addition, there is no limit on the number of songs a singer/songwriter can have entered in the contest, and theoretically it is possible for one singer/songwriter to win more than one prize. Singer/songwriters who have not yet appeared on Alive with Clive should thus take note of my Blog post, “The Top 20 Benefits of Being a Guest on Alive with Clive!” which you can see when you click here, and submit requests to be on the show as soon as possible, whether or not the songs to be performed on the show are inspirational in nature. If necessary, aspects of the plan will be altered to enhance the contest. This contest to determine The Most Inspiring Song Sung on Alive with Clive So Far! is in perfect alignment with my purpose for being on the planet, which is to be a catalyst for us to inspire each other to experience optimum fulfillment in life and thereby create an upward spiral of brilliance and joy in the world. It will run in tandem with the contest to determine the singer/songwriters to be included in future Alive with Clive Top 20 compilations, for which voting is continuing. It is also the forerunner to even more exciting and audacious contests that will be introduced after the winning song in The Contest To Find The Most Inspiring Song Sung on Alive with Clive So Far! is determined. So be on the lookout for more information about this contest as well as Blog posts from me featuring additional inspiring songs that have been performed on Alive with Clive so far. http://alivewithclive.tv– multiplying magnificence one guest at a time! http://alivewithclive.tv/blog— It’s not just a TV Show. It’s a Global Community! This entry was posted in Inspiring Song Contest and tagged 4RON, Alex P. Taylor, Alive with Clive, Alive with Clive Gift Store, Alive with Clive Global Community, Alive with Clive Most Inspiring Song Contest, Alive with Clive TV Channel on YouTube, Anthony Melillo, AWC-MISC, Bryan's Song, Cassandra Kubinski, Chalk on the Sidewalk, Cradle The Moon, Dan Sheehan, Dani Tersini, Daria Musk, Dave Beck, Diana Page, Extraordinary You, Failure Is Impossible, Firan Chisolm, HIV/AIDS, I'm Alive with Clive, If You Build It, Inspiration, Irena Hart, Jeneen Terrana, Jessica Labus, Joe Travers, John Taglieri, Joséphine, Karen Jacobsen, Kylie Edmond, Leap Of Faith, Lisa Redford, Live Your Life, Meant To Fly, Melting Moments, most inspiring song contest, My Creation, New Book, Oh No No, Religion, Rock Song, Save The World, Serotonen, South Africa, Starring Role, Susan B. Anthony, Synergistic Promotions Corporation, That's My Son, The FIRST Alive with Clive Top 20, Top 20 Benefits of Being a Guest, Untied, Window, Without Love, You Got To, Your Life Depends On This. Bookmark the permalink. 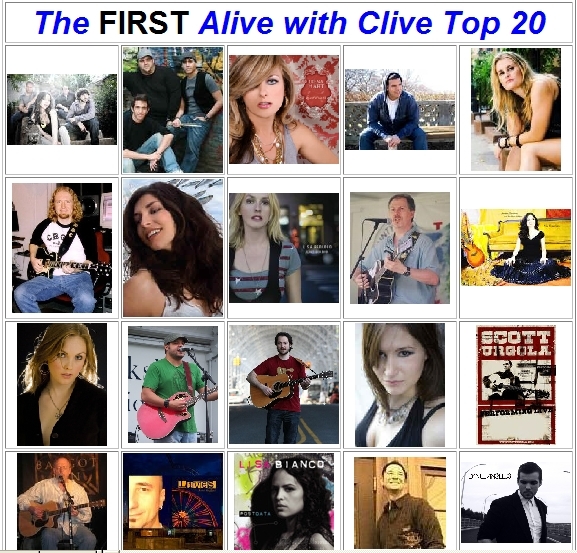 3 Responses to The Alive with Clive Most Inspiring Song Contest – 121911 Update!